"It is tremendous to see RIAs not only acknowledging these factors, but also taking the steps necessary to position themselves to maintain their growth momentum and cement the foundation for their firms’ futures." DENVER--(BUSINESS WIRE)--Reflecting a proactive stance to ready their firms for the future, independent registered investment advisors (RIAs) are taking steps in the areas of leadership, talent and business legacy planning, according to the results of the latest Independent Advisor Outlook Study (IAOS) released today by Schwab Advisor Services at its annual IMPACT® 2014 conference. The study, which reflects responses from 740 RIAs representing $243 billion in assets under management custodied with Schwab, found that identifying the next generation of firm leadership and cultivating talent are both firmly on the strategic agenda for RIAs. Nearly half of firm principals surveyed (49%) say their firm has already identified the individuals who will take the leadership reins in the years ahead. And, of those who report having identified their firms’ future leaders, 37 percent of principals say that successors are already extremely prepared to lead the firm into the future. In addition to their future leadership, firms are paying attention to the talent pipeline of younger advisors, with increasing emphasis being placed on greater firm diversity. One in four advisors said their firms are already making efforts to recruit diverse employees, and an additional 15 percent indicated they will be making efforts in the future. When considering the appeal of their firms to candidates under the age of 30, the majority of advisors surveyed (64%) believe that their firm would be seen as ‘striving to be flexible across generations’ and an additional 13 percent think such a candidate would consider the firm a ‘perfect fit with their generation’. In addition to leadership transition and talent, one in three advisors reported that their firms have been taking action the past five years to grow their business beyond organic firm growth. When asked about what actions they have taken, they report bringing an individual advisor with a transferable book of business into their firms (54%) or acquiring, joining or merging with another RIA firm (51%). The leading two reasons for taking these specific steps are cultural fit (59%) and alignment of business models (49%). The IAOS results also indicate that the sale of their firm might ultimately play a role in legacy planning for some advisors. Forty-nine percent said they would sell their business in the next five years for the right price (30%) or to the right partner (25%). Of those that would consider selling their firm, 75 percent would sell to another RIA firm and 35 percent would consider a strategic acquiring firm. As next generation firm leadership steps up to play a larger role in strategy and planning, the IAOS findings indicate differences emerging between the current and future leaders. These differences will likely play a role in shaping how RIA firms evolve over the coming decade. While the two generations share a common perspective on areas such as education, relationship management and investment strategy, more than half of advisors believe that the generations differ in areas including philosophy on technology use, business development and marketing expertise, talent acquisition and the desire for innovation. Earlier this year, Schwab conducted the Generation Now Study for RIAs, which looked at affluent individuals between the ages of 30 and 45 who are following on the heels of advisors’ current pre-retired or retired clients. Schwab refers to these individuals as Generation Now and, with control of nearly $3.5 trillion in investable assets today1, Schwab believes they represent one of the most significant opportunities for RIA firm growth in the decade ahead. The current IAOS asked advisors for their perspectives on different generations of clients and found that they believe individuals in the Generation Now group have a greater lack of trust of financial institutions and advisors than their parents’ and grandparents’ generations, and that they place higher value on fee transparency but less emphasis on personal service. According to the current IAOS results, winning new clients is likely to occur in an increasingly competitive landscape, with one in three advisors reporting that competition for their clients’ business has increased in the past two years. One in five advisors view automated investment advisory services as a competitive challenge when it comes to acquiring Generation Now assets. At the same time, more than half reported they would implement such an offering to target younger investors (54%), as well as investors with less than $100,000 in investable assets (45%). This aligns with the finding that nearly half (48%) of advisors believe an automated investment advisory solution would help their firm serve small clients more efficiently. Most advisors (40%) don’t yet know how they would implement an automated investment advisory solution - one third (31%) say they would outsource to a third party, while fewer (19%) report they would buy capabilities to implement internally, and one in ten are planning to build capabilities in-house. In related news, the Charles Schwab Corporation recently announced the planned launch of Schwab Intelligent Portfolios™, the company’s new automated investment advisory service, which it plans to make available to retail investors in the first quarter of 2015, with a white label version for RIAs available shortly thereafter. Sixty-five percent of advisors predict that the S&P 500 will increase over the next six months, a slightly more bullish stance than the previous two waves of the survey. Despite relative optimism about the S&P, advisors hold a much stronger opinion now (compared to May 2014) that there will be a market correction in the United States in the next six months (74% vs. 30%) while a similar number still predict that interest rates will rise (64% vs. 66%). Just over half of advisors (54%) report that the current geopolitical environment is negatively affecting clients’ investment confidence. While the majority of RIAs (76%) are using mobile apps outside the office in their personal lives, only 41 percent are currently deploying this technology within their firms. Although, an additional 34 percent are planning to leverage mobile apps in their business within the next two years. More than two-thirds of advisors already use technologies within their firms that deliver real-time information and data, and the same number are also currently using or planning to use video chat. 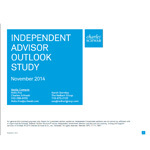 The Independent Advisor Outlook Study, conducted for Schwab Advisor Services by Koski Research, has a 3.65 percent margin of error. Koski Research is not affiliated with nor employed by Charles Schwab & Co. Inc. All data are self-reported by study participants and are not verified or validated. Advisors participated in the study between September 10 and September 23, 2014. Schwab Advisor Services™ serves independent investment advisors and includes the custody, trading, and support of Schwab. Independent investment advisors are not owned by, affiliated with or supervised by Schwab. ©2014 Charles Schwab & Co., Inc. (“Schwab”). All rights reserved. Member SIPC.